Establishing a bio-secure swimming facility begins at the pool design stage. 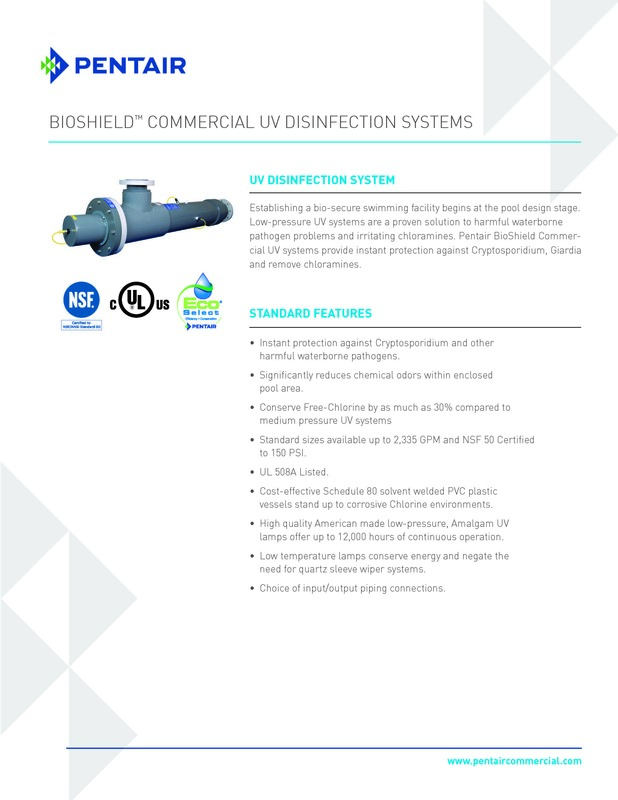 Low-pressure UV systems are a proven solution to harmful waterborne pathogen problems and irritating chloramines. Pentair BioShield Commercial US systems provide instant protection against Cryptosporidium, Giardia and remove chloramines. • Selection of cost-effective Schedule 80 solvent welded PVC plastic vessels stand up to corrosive Chlorine environments. • Standard sizes available up to 2,335 GPM and NSF 50 Certified to 150 PSI. • Compact footprint models require less operating space. • High quality American made low-pressure, high output UV lamps offer up to 12,000 hours of continuous operation. • Water-tight design protects all electrical hardware from water damage. • Enhanced, state-of-art electronic ballast, sized precisely to the lamp’s power requirement, ensures optimal UV-C output and maximum lamp life.